What Is Your Favourite Lamy Safari/ Al-Star Color Ever? Safari-wise the Aquamarine was great but for me the Orange special edition just beats it to first place. As for Al-Stars I really liked the all black special edition - the polar opposite of an orange Safari! I covet the Ruby Red Al- Star. They come up on Ebay for prices in the $80.00 range. This is my favorite color as well (I have two, in fact. Luckily, I paid the original price for them!). My Favoutire Colour would have to be the Bue-Green Al-Star. I really like the Al-Star Fountain Pens, and now have them in a few different colours, but I have to say that the Blue-Green is my current Favourite! I really love my special edition coffee. I love brown inks and it pairs nicely. My favorite is the white Safari with a red clip. I believe it was a special edition, given the price I paid for it, but it matches my Vespa . I would love it if they made a red one with a white clip, but I don't think they ever made Safaris with white clips? I only have 3 Lamys and it looks like I chose the favorite colors of everyone on this thread. The Joy is the best italic pen I own. The Coffee AlStar for me! 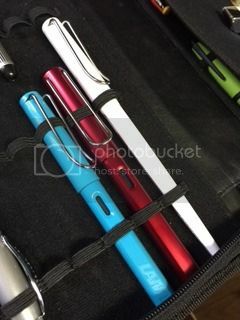 Considering the ever expanding colors and editions of the Lamy Safari/ Al-Star lineup, I was wondering what colors are the most sought after here on FPN. Do you own that particular favorite or are you looking for it? In my personal case, it's got to be the Coffee Al-Star and the NK-edition Charcoal with red clip. What's yours? +1 on your choices. I have a Ruby Red, which was my first Lamy and it is nice. I want a coffee colored one but not willing to pay the price of them now. Edited by MKeith, 03 November 2014 - 22:41. New-ish to the hobby. Of those I have, Blue-Green Al-Star, by far. Then the neon coral Safari. Edited by FountainPenCowgirl, 04 November 2014 - 02:24. It's beyond explanation, but I really like my "Bic Yellow" Safari. Anyone else here so afflicted? Ruby red is also amongst my favorites, but I've yet to buy me one -not willing to pay the 100+ dollars those are going for! My to some extend... The yellow one (chrome clip) was my first Lamy, so am kind of really fond of it. I like the Apple Green Safari. I usually fill it with Visconti Blue and the contrast between the 2 is pleasing for me and evokes lots of "oohs" & "aahs". the cheery light blue with red clip - liked it so well I have two! edited to add: 48 people are currently viewing the new Lamy Forum - a successful addition I think. Edited by pen2paper, 07 December 2014 - 02:38. Place To Test Lamy 2000 Near Dfw?